After trekking through the jungle for days, and being at high altitude for months, we were ready for a beach! So we headed to the closest beach we could find. 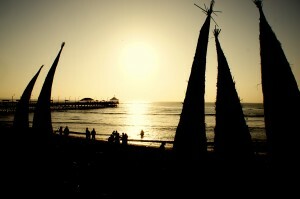 Huanchaco is a beach town very close to Trujillo, Peru. 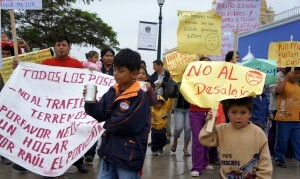 When we arrived in Trujillo we were welcomed by a group of protesters. Protesters seem to be everywhere in South America. I loved the expression this little boy’s face so I snapped a quick pic. 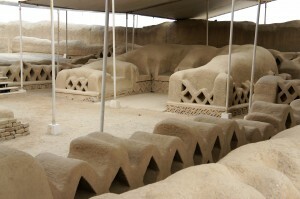 We took a tour (completely in Spanish) which brought us through some archaeological sites on our way to the beach. I felt like Indiana Jones for the day. The sites basically gave you free range to go and see whatever you wanted. 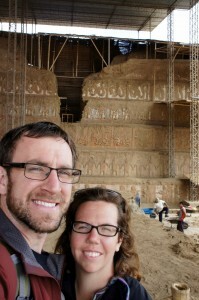 Archaeologists were everywhere and we got to walk around side by side with them in their workplace. After walking around in the hot sun all day it was time for the beach! Huanchaco is a small beach town on the Pacific coast. There were quite a few surfers here, and the waves a perfect size for the beginner surfer. For us, the main attraction was ceviche! Leah had been craving sushi for a while, and she got her fill here. 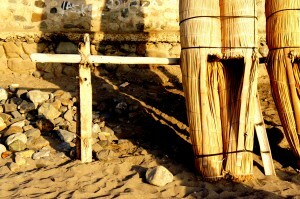 The native people of the Huanchaco region used these interesting reed boats, which now are mostly used for tourist rides. 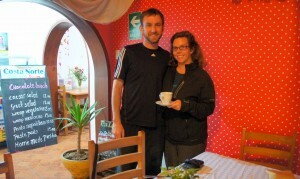 Joking aside, the food was amazing and the company fantastic. It was great to see Leah laughing and talking with a group of ladies, she misses her friends from home. Although these ladies weren’t a replacement, they did bring a lot of joy.